UC Santa Cruz’s Institute of the Arts and Sciences (IAS) will present a dramatic, four-screen video installation in San Francisco, hosted and co-sponsored by Minnesota Street Project (MSP), the city’s new contemporary art venue, from May 20 through June 24. Titled Unearthing Disaster I & II, the installation was created by Berlin-based artists Angela Melitopoulos and Angela Anderson. Their work examines the destruction of a pristine, mountainous forest region in northeastern Greece by a Canadian mining company. The idea for the exhibition in San Francisco emerged last fall from the IAS’s collaboration with UC Santa Cruz professors T.J. Demos (History of Art and Visual Culture) and A. Laurie Palmer (Art). Demos, founder of the Center for Creative Ecologies at UCSC, and Palmer were creating EXTRACTION--a year-long series of classes, speakers, film screenings, and field trips, which will culminate with a final conference on the UC Santa Cruz campus, May 12 and 13. When it became clear that the Berlin artists would play a role in the conference, IAS director Weber reached out to the Minnesota Street Project to see if a San Francisco venue could be arranged for their work. Arts patrons and investors Deborah and Andy Rappaport, the founders of the venue, quickly agreed to donate space and co-sponsor the installation. Opened in 2016, Minnesota Street Project has rapidly become a new center for the city’s art scene. Profiled in January in the New York Times as “America’s Next Great Art Neighborhood,” it houses a number of art galleries and collaborates with non-profit and educational institutions to offer public programs and exhibitions. Unearthing Disaster I accompanies local activists on a journey through their once-familiar landscape, made unrecognizable in a matter of days by the impact of industrial resource extraction. Their journey reveals an imminent ecological disaster with thousands of trees cut, clean water disappearing from the mountain, and the sell-out of the region by local politicians. The artists show violent police and private security clashes with protestors gathering to oppose the mine. They also document encounters with workers who vehemently defend the mining project. Unearthing Disaster II offers an overview of the stakes in this struggle. 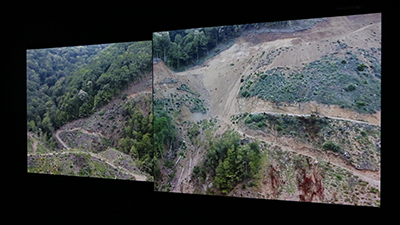 It contrasts the ecologically intertwined networks of plants, trees, streams, and earth with the massive, violent, mechanized destruction of these networks in the name of profit and capitalist “development.” The artists document a relentless onslaught on the idyllic Greek landscape, already transformed into a defoliated mountaintop desert. Unearthing Disaster I & II runs May 20-June 24 at the Minnesota Street Project, with a public reception for the artists May 20, from 5 to 7 p.m. (1275 Minnesota Street, San Francisco). Admission is free and open to the public, Tuesday-Saturday, from 11 a.m. to 6 p.m. 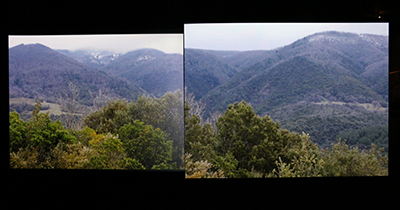 It is exhibited in conjunction with EXTRACTION, a conference May 12-13 at UC Santa Cruz, presented by the Center for Creative Ecologies, and co-sponsored by the Institute of the Arts and Sciences (IAS). For more information about the artists, visit the IAS web site.